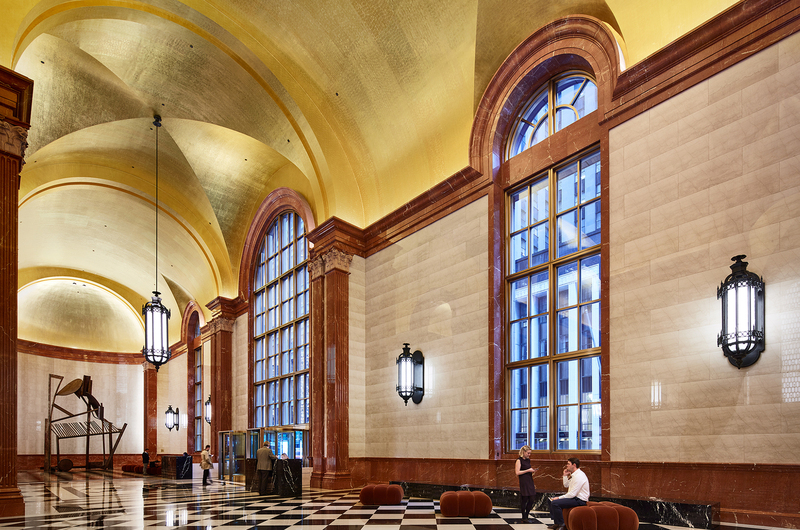 A New York based real estate developer engaged George Sexton Associates, an internationally known Lighting and Museum Design firm, to update the lighting in the iconic lobby of 190 South LaSalle in downtown Chicago. Designed by Philip Johnson and John Burgee in 1987, 190 South LaSalle brought postmodernism architecture to the heart of Chicago’s financial district along with its impressive lobby that is both timeless and elegant. This opulent lobby showcases a gold-leafed 55-foot-high vaulted ceiling, a 28-foot-tall bronze modern sculpture, stone-clad walls and checkerboard black and white marble floors. The original lighting in the lobby was outdated. The indirect lighting on the vaults consisted of a system of Cold Cathode CFL self-ballasted lamps that were 6-inches on center, visible from below and created hotspots on the reflective ceiling. “The design objective was to integrate the lighting with the architecture and make the lighting throughout the lobby seamless and quiet with concealed sources”, stated Sexton. This was accomplished by up-lighting the ceiling with Tempo’s low profile C6R high-lumen, linear LED cove luminaires with 3000K CCT throughout the lobby and elevator bays. In addition to improving the cove lighting, Sexton also updated the monumental sconces and pendants by using Tempo’s mid-lumen C5R linear luminaires, “The fixtures are grand but the light they delivered was glary and reflected noticeably in the glossy marble walls”, shared Sexton. The fixtures were refitted to take Tempo’s linear LED luminaires and diffusors were added to the glass to soften the illumination and provide a more even and less glary light distribution. Consequently, the overall experience of the lobby was enhanced by adequate light output and the use of the ideal color temperature for the space, making it more beautiful and elegant. To learn more about the Tempo lighting installed at 190 South LaSalle, click on the product links.